BHC-200 TV Monitoring System is determined for monitoring boreholes with diameter 150 - 800 mm. The camera head is inserted to the hole by means of a pulley mounted on a tripod stand. 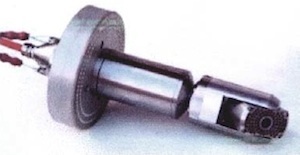 It is a stainless camera head rotating along its axis. In the front of the camera is a camera module that enables a vertical view. Second camera, in the angle of 90o to the front one, gives a side view. Switching the front and side view is done from the portable surface unit. 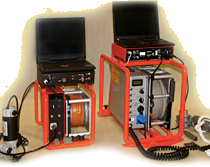 The borehole situation is continuously displyed on the surfice unit monitor with an immediate CD/DVD record and with the possibility of photodocumentation. The depth is meassured with an OSD CCK measuring digital card. The system can also be completed with a text fill-in possibility and continuous record of the camera head distance.